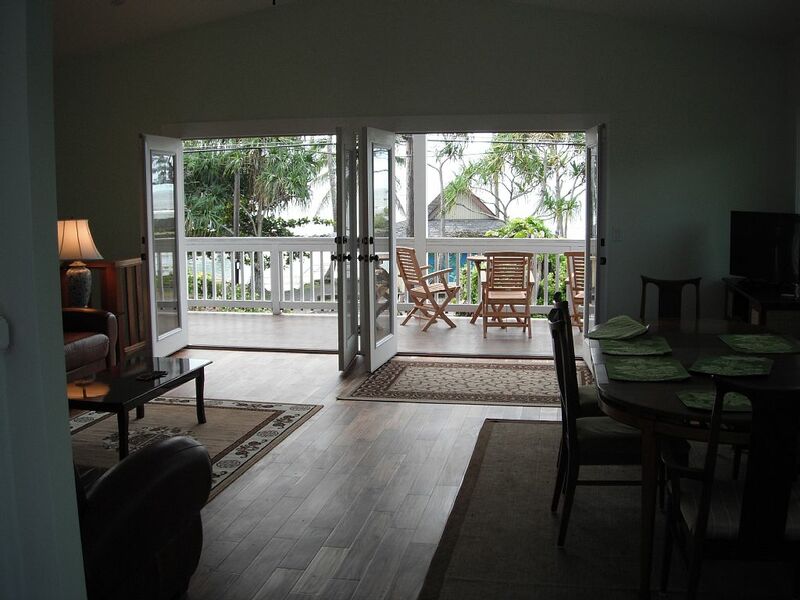 This Hilo vacation rental home fronts best beach park in town of Hilo, Hawaii: snorkel, swim, kayak, boogie board, BBQ. Most family friendly! Keidi (child) pond in front of house where Hawaii’s children learn to swim. VRBO house 4035464ha. This is a large 2,200 sq. 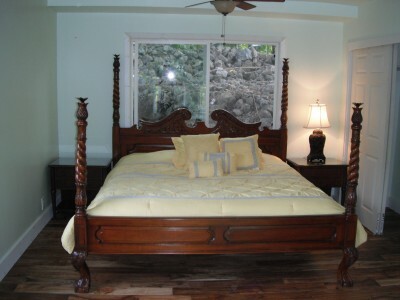 Ft. designed as a vacation rental home with two bedrooms/two baths upstairs and two bedrooms/one bath downstairs. House will sleep 15! Tankless hot water heater for unlimited hot water. No expense spared in new construction. French doors can be left open to let the outdoors in. Protected swimming and snorkeling areas with lifeguards. Both living rooms, kitchen and dining area, have unobstructed ocean views. This house is right next door to my Lilikoi beach house. 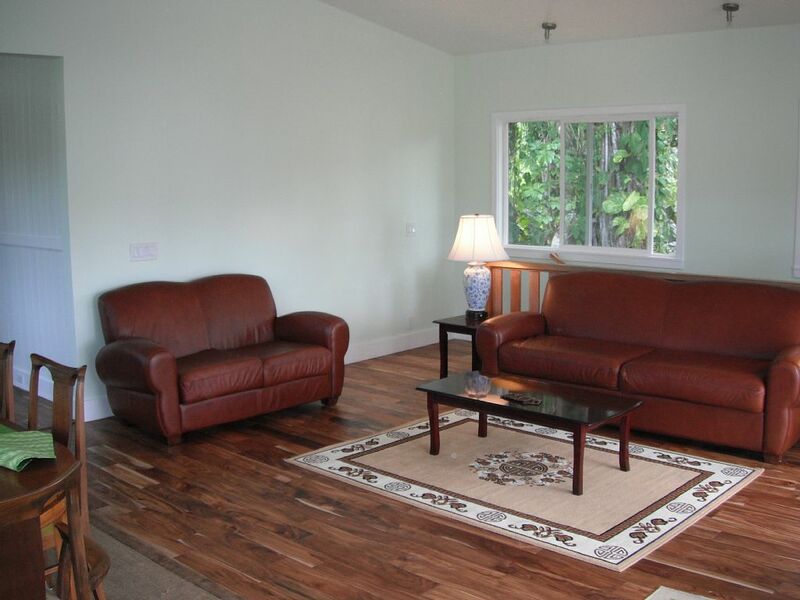 Both homes are located in the town of Hilo, just 5 miles from the airport. 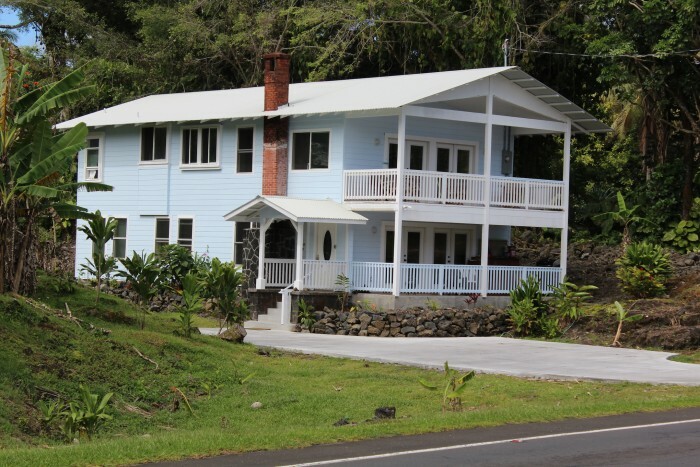 I own 7 vacation rentals in Hilo so please reach out to me at hilovrhomes@gmail.com if you would like to check on the best house for your party and budget. 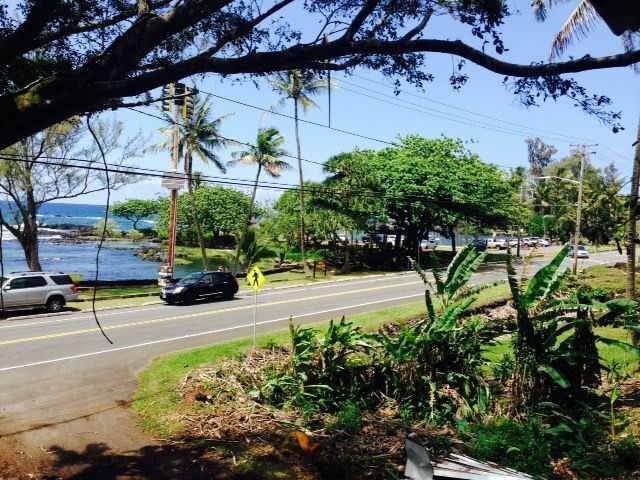 This beach house is close to Hilo farmer’s market, restaurants, shopping, waterfalls, volcano national park with active volcano, farmer’s market, tours, astronomy center, university of Hawaii, Hilo medical center (hospital), and visitor activities. See the Activities tab on this website. 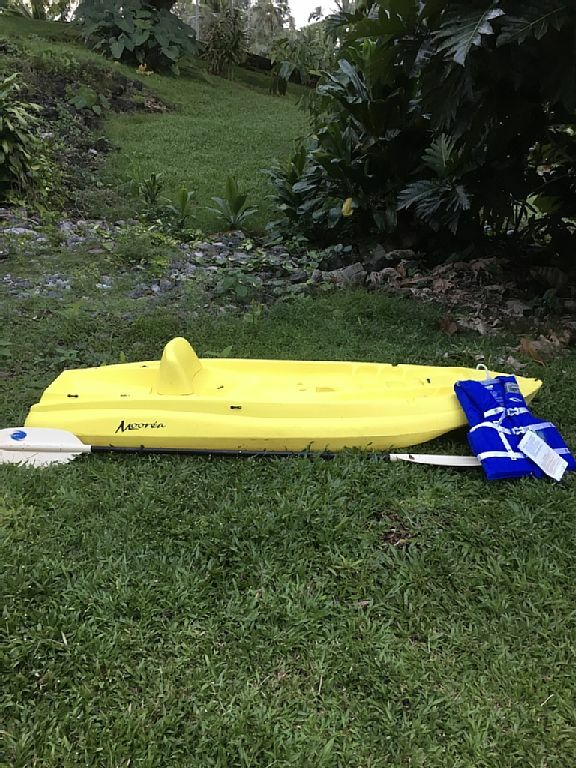 House is equipped with kayak, boogie boards and beach equipment, Netflix, and high speed cable internet access (WIFI). Available year round for nightly, weekly, and extended stays. Owner of 4 homes Hilo vacation rental homes directly across from Richardson’s beach park and 3 ocean front homes in Paradise Park. I manage these homes personally with my cell number available to all guests. Payments are handled through the security of the Homeaway/VRBO site. Guests also receive information on restaurants, shopping and my favorite places to visit. This new house was constructed to be a world class beach park house. Large windows open to large decks. Breezes blow right through the house. Wall controlled ceiling fans throughout. Ceiling lighting, only the nicest appliances. Leather couches, wood flooring, complete cookware. If you plan on staying more than a couple days, you will want to enjoy the location. If you love the water and especially snorkeling, you will not find a better location. The best snorkeling is in just a few feet of water right in front of the black sand beach. It is like swimming in a tropical fish store. Green sea turtles come to rest for the night in the evening at the rocks just beyond the black sand beach. The water is largely sheltered by the rocks creating a partial lagoon. Yet this house is just down the street from downtown Hilo. Great for quick trips out to eat, shopping and many tourist locations. 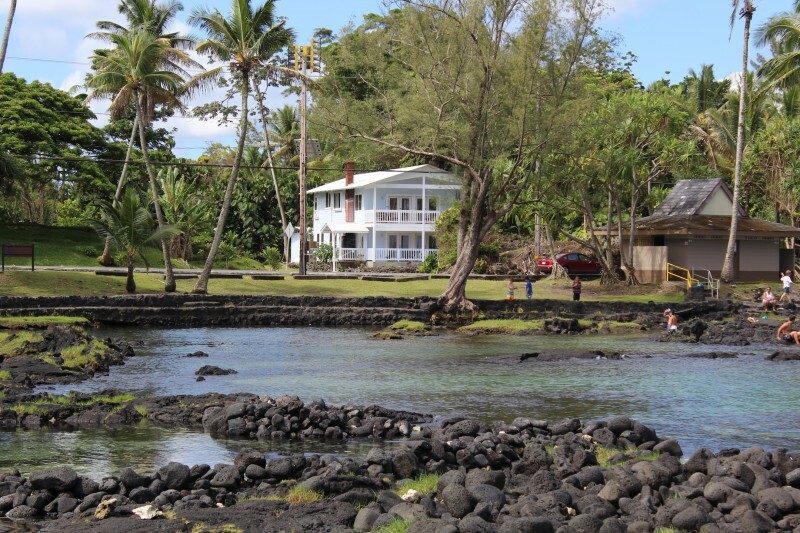 Lyland museum featuring a historic Hilo settlement and geological rocks. Historic Palace Theater downtown. Check www.hilopalace.com for showtimes. House is equipped with high speed cable internet access (WiFi) and Netflix. 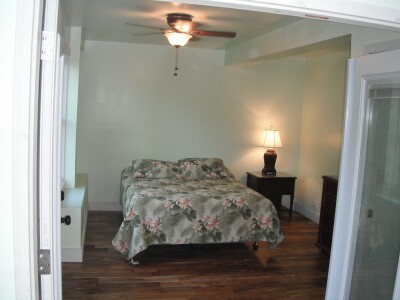 Bedroom and Bathroom configuration: Master bedroom with queen size bed on upper floor with attached full bath. Beautiful pineapple poster bed with ceiling fan and garden view. Bedroom located upstairs across kitchen and behind living room. Bedroom #2 is located upstairs and the end of the hallway. It features a queen bed, ceiling fan and garden views. Across hallway from bathroom #2. A full bath with tub/shower combination. Bedroom 3 is downstairs off the lower living room. Double french doors that can be left open to let in the ocean air in when the main french doors are open. Bedroom features a queen bed and ceiling fan. Bedroom #4 is downstairs and the end of the hallway. 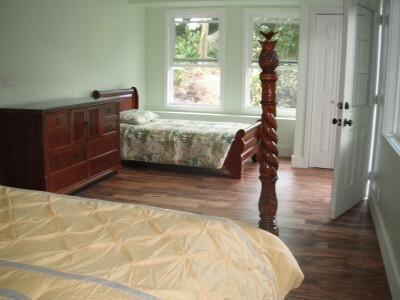 This is a very large bedroom with a king bed in addition to a twin bed. 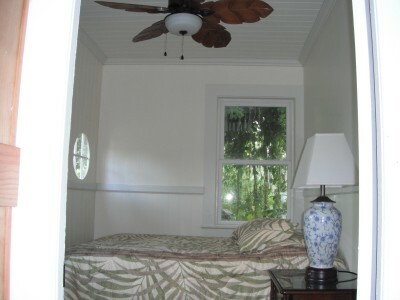 The bedroom features duel ceiling fans and garden views as well as access to the backyard. Bottom bedrooms share a full bath. 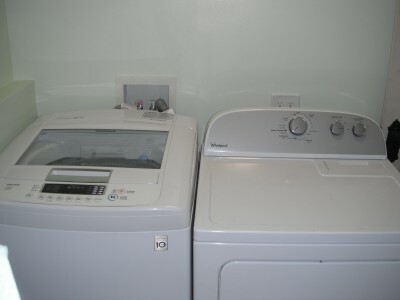 The bathroom also features a large and modern washer and dryer. Kitchen and Dining Room: New, modern appliances, cookware and plates/flatware for very large parties. Stocked with accessories such as blender, toaster, coffee grinder and coffee maker, rice cooker, hand blender and lots of cooking tools. 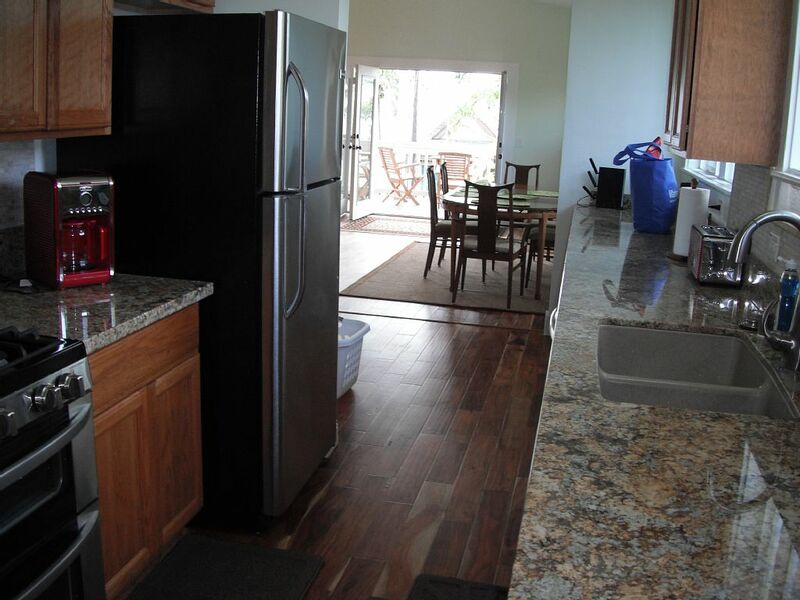 Kitchen has views across dining/living room out to Hilo bay. Dining room table seats 6 with additional tables and chairs on deck. 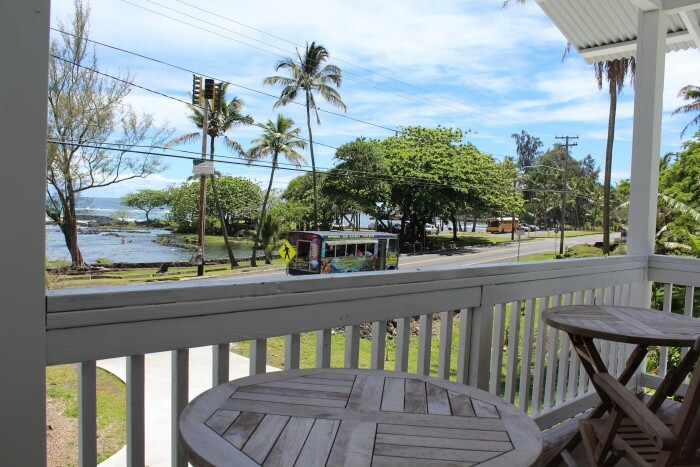 Dining while enjoying the ocean is why you booked a Hilo vacation rental home instead of a hotel, so please take advantage of the great location. Living Rooms: Upstairs living room has upper deck with views across Hilo bay. Leather couch and love seat with queen size fold out bed. Television with Apple box for viewing Apps, Amazon Prime and Netflix. Downstairs living room has lower deck and queen size fold out couch. 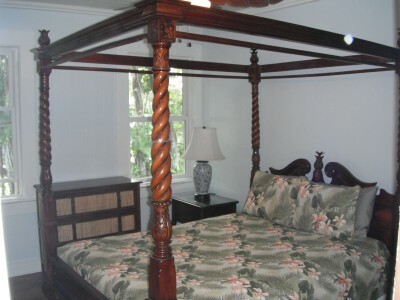 In addition there is a daybed and trundle bed for additional sleeping options. Lower deck as additional seating and gas BBQ. 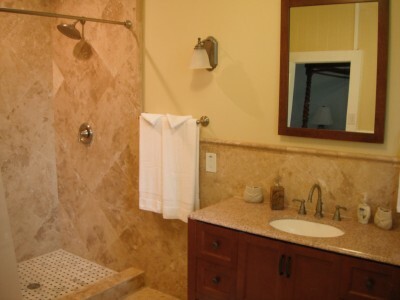 Amenities: Shampoo, conditioner, bath towels, hair dryers, washer, dryer, cleaning supplies, beach towels. 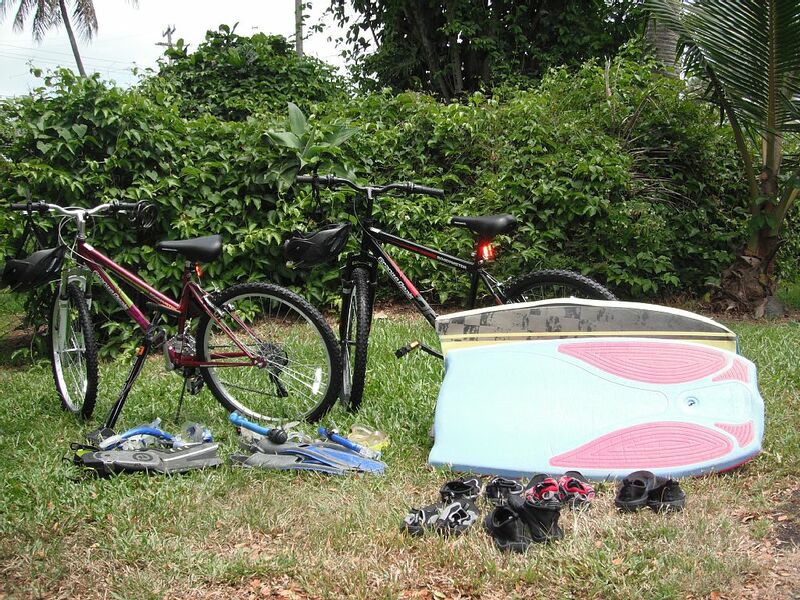 Also, two bikes, kayak, boogie boards, masks, snorkels and booties. Folding chairs to take across the street if needed. Play pan and high chair in each house. Notes: Rates are based on 14 guests; and add $25.00 per night, per additional guest. Date of stay March 5, 2017. Copied from VRBO. Jim B. says: Beautiful home. Super location. The house was clean and well kept. Just as the pictures show. We will definitely be back! Thanks Richard for everything! Date of stay - January 23, 2017. Copied from VRBO. 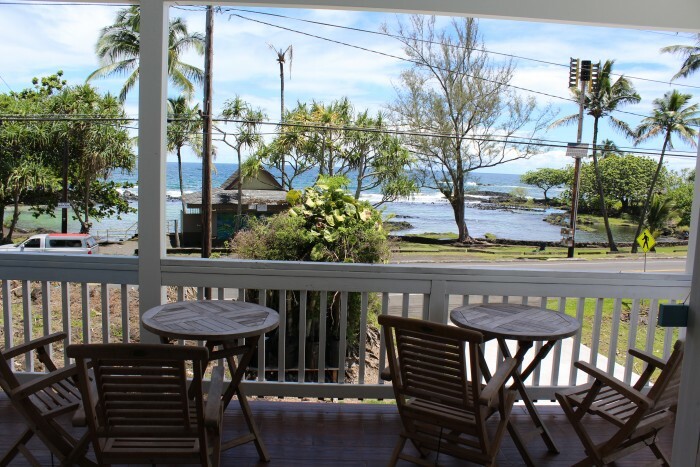 Reginia says: A very practical set up in a perfect Big Island - HIlo location to relax and enjoy the ocean view. The beach park right in front of the property is lovely. Date of stay: January 5, 2017. Coped from VRBO. 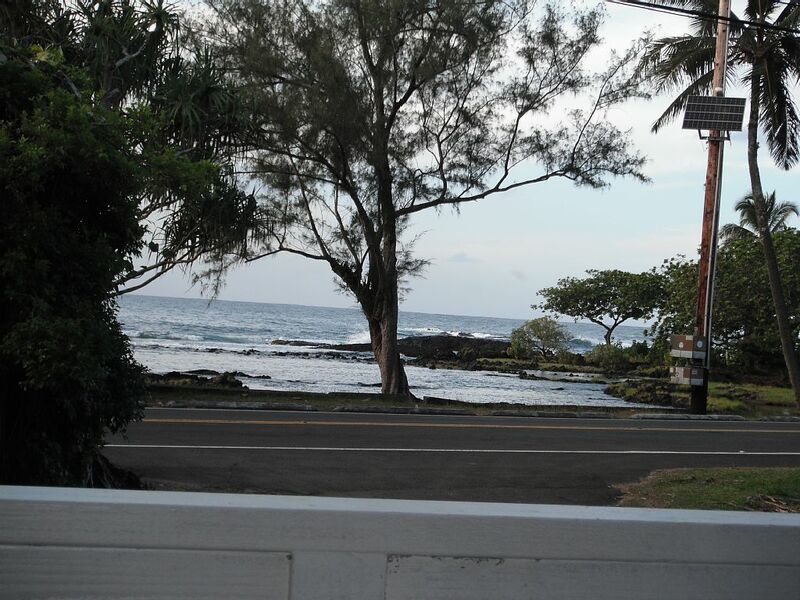 Jodee C. said: Rented this vacation house becuase our baseball team was playing in a tournament in Hilo. in Total we rented 3 of Richards Houses across the beach. Honestly after seeing all 3 houses I loved ours the most! Upstairs Kitchen although a little narrow had all the amenities we needed. Upstairs porch gorgeous view of the beach. Large upstairs living room that we could hang out in and watch Netflix on and chill. Looks like the house was renovated and extended they did a good job with it, the hallway isn't quite complete yet but no big deal. Downstairs has a full washer and dryer in the bathroom which was perfect to wash the uniforms in. Downstairs is very comfortable as well and there's a pull out and day bed with an under bed that pulls out and there's a mattress in the closet. All the kids chose to sleep together there and the adults had the rooms to ourselves. It was a large home and our stay was Fantastic! So many places to enter the beach along this shorline and it was only about 10 minutes to downtown hilo area. Very convenient! If we play next year I'll be staying here again, thanks!! Date of Stay - December 4, 2016. Copied from VRBO. Terri B. said: Very nice location and home was well-kept. We only stayed 2 nights in Hilo, and we could have stayed longer in order to see everything on that side of the island. it was a good time, and we really enjoyed our stay. Date of Stay November 29, 2016. Gregory K said: Very, very nice place! Well equipped and spacious. Close to Volcano and waterfalls. Great eateries nearby. Beautiful parks in front. We saw 8 sea turtles resting on shore. Only negative was heavy rains in Hilo during our 4 night stay but easy to drive to sun when it did. Thanks Richard! Greg. My Response: Thanks for the nice review. You had horrible luck with the weather. Even by Hilo standards, these were extremely rainy days. Date of Stay - October 17, 2016. Copied from VRBO. 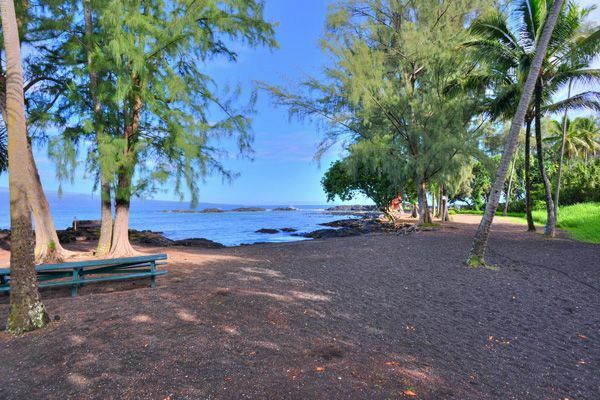 Erinn said: This house is directly across from a string of ocean front parks, including Richardson Beach with its black sand and easy water access. Green sea turtles frequent this area and we even spotted a couple just sitting on the deck. It is a great location for snorkeling, swImming, body boarding or surfing. Plus, it is only a few short miles and a simple drive from downtown Hilo with its fantastic farmers market and wonderful eateries. Within a short drive are many outdoor recreation opportunities (waterfalls, botanical gardens, Volcanoes National Park and many more). The vacation rental house is clean and well stocked (they even left a fresh coffee filter in the machine ready to go!). There are lots of sleeping options with four designated bedrooms and one open family room with a fold out bed and day bed. There are also three full bathrooms and a newer washer and dryer. 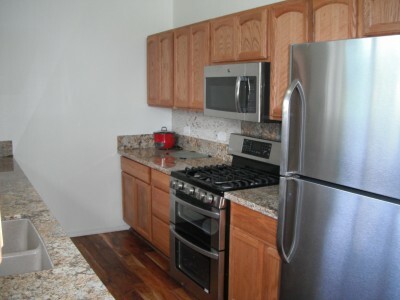 The kitchen is narrow, but has lots of counter space and has nice appliances and is well equipped. There is parking in the driveway for possibly three vehicles. This home could easily fit a larger group of people (12 or possibly more). We only had our family of five and it was very comfortable. There are plenty of fans and windows to keep the home comfortable and not too hot and muggy. We loved this home, it's amenities, view and location. Richard was super easy to work with and responded quickly to any questions and seemed very friendly. We would definitely consider staying here again and working with Richard. Wish we could have stayed longer. Mahalo and Aloha! Date of Stay - August 17, 2016. Mark B. said: Very large and usable. The decks out front and the views are amazing. We used the BBQ for many meals. Lots of seating. The vacation rental house was very clean and new. The location is very close to town and everything you want to see. Richardson's beach park is truly a gem. I can see why all the tour busses go there. It is so great to simply walk across the street and have that kind of snorkeling available. We used the kayak a lot. Bikes came in handy also. As Richard suggested we used his web site to know what to do. There is lots to do and we certainly would have loved to stay longer. We would love to come back. Date of Stay - August 6, 2016. Copied from VRBO. James C. said: The house is very comfortable and usable. The kitchen has everything you need to fix meals, and plenty of sleeping options. Bathrooms are super clean. 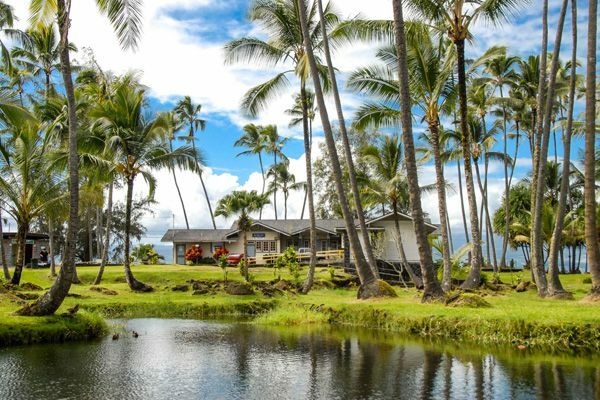 The house fronts the best lagoons and parks in the Hilo Bay Area. You will see all kinds of sea life including a sea turtle that stays in Richardson beach park. You can't beat the location of this beach house. Excellent communication and a smooth process from Richard. Best bang for the buck!